As part of the Hybrid Pedagogy’s week-long MOOC about MOOCs, I wrote some quick thoughts in relation to some of the questions posed yesterday. They seemed worth sharing beyond the confines of the LMS that is housing the course. So here goes. What happens when learning happens? In a word – change. It is when that seed of newness, no matter how buried it may have been, sprouts and breaks through the surface to find light. It need not be necessarily new at all, but it is new to the learner. Nevertheless, it is the single most powerful agent of change for human beings. It is not distinctly human, but we have quite well taken to it, to be sure. And it happens everywhere, so long as one is willing to pay enough attention, to be brave enough to, in fact, notice what we notice. For me learning has always been the ultimate high. Honestly, I simply cannot conceive of life without the hunger for it. It is synonymous with breathing or living, as sappy as that sounds. 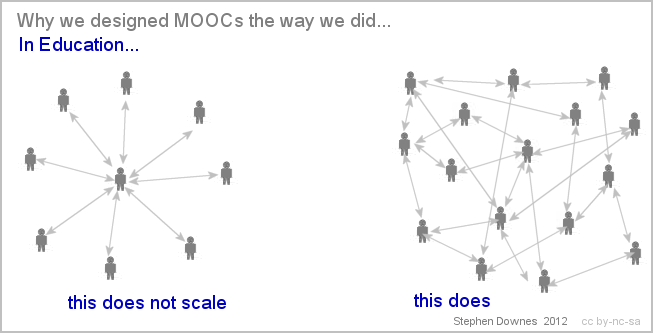 For me, MOOCs are a bit like the equivalent of the 60s “happening,” only predicated on digital spaces, learning, and openness. They seem to me connected to some of the same urges, although I certainly hope that they have stronger legs that the past phenomenon. My fear is that they are already the fashion that has ceased to be the fashion. Now that the corporate interests are moving in to pick over any ideas that they think might be profitable, MOOCs are likely to be reduced to the point of being unrecognizable. Already a gathering is happening that is still very interested in being Massive and Online but a whole lot less Open, and likely to be less like Courses and more like training, even little more than self-perpetuating propaganda. History is already being somewhat rewritten in the mainstream press celebrating the interests of an elite few, like Udacity, edX, and the like, as if they created something when all they have really done is begun to prey on the speculative ideas of a handful of curious academics, hoping that they find a cure for the old models of preservation. I know that sounds pretty lefty, but I can’t quite see a narrative that wrangles this phenomenon we are witnessing and participating in nearly as well as what I am outlining. Openness is still generally not perceived as a clear competitive advantage in the marketplace. It is getting some traction. However, it is in conflict with the proprietary nature of commerce. If it is open or free, how does one own it or put a price on it? The Massiveness is both an opportunity and an obstacle. It is arguably the greatest aspect that violates our previous notions of how Courses of study work. If we accept the notion that learning happens in an individual and that few models have ultimately bettered a one-to-one approach, the sheer scale, while seemingly a holy grail for profiteers, is potentially threatening to a lot of people. That takes some getting used to. However, it also provides few obvious or prescribed pathways to the kind of connections that foster collaboration or personal engagement with others. My hope is that there will always remain a fierce set of individuals willing to continue to experiment with the MOOC concept and what it can reveal. So I continue to follow the main movers on what is now commonly referred to as the cMOOC front. For me, that has always been where the best action is anyway. I just hope people like Siemens, Downes, Cormier, Couros, and others keep on trying things and thinking about all of this so there is always an alternative to the commercial outfits. I feel like the possibilities are good. MOOCs are extraordinary opportunities for learning. Since they do not fit into the existing power structures of our educational system, at least yet, they are kind of extra-curricular, in the noblest of ways. They are opportunities for learning and enrichment that really are the outgrowths of this new digital, virtualized landscape that we are all wrestling with how to navigate and traverse. They can easily become a network, a community of practice, an artifact of some quest. Their very nature is morphing and evolving as we participate. They are a kind of fabricated organism, really. They have been a great source of learning and professional development for me, personally. One of my favorite thinkers on some of this new frontier is University of Bournemouth’s Steven Heppell has said, “History will look back on the 1950s to 2000 as the period of aberration…Cross-fingers and learning will survive, but it might just be the death of education.” I feel a bit like MOOCs are currently the best realization of this ideal, which makes for living in very interesting times, indeed. This entry was posted in Learning, Teaching & Learning and tagged Alec Couros, cMOOC, Dave Cormier, George Siemens, Happening, MOOC, MOOCMOOC, openness, Stepehen Downes, Stephen Heppell on January 8, 2013 by Fred Haas - @akh003.